A dead phone equals getaway misery. Set out a bowl with power strips and cords, outlet converters, and even an iHome speaker. Your guests will thank you, especially if they forgot theirs! 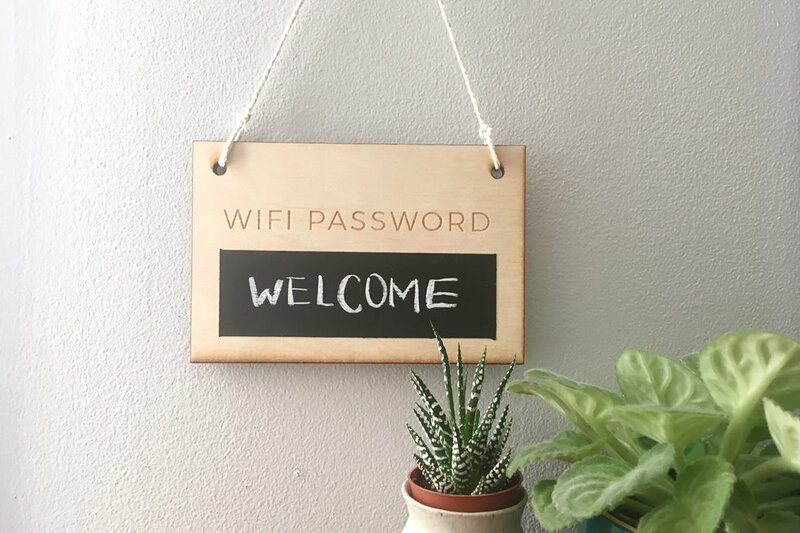 Another great tip---Post your Wi-Fi name and password in the guest room so they don’t have to bug you. 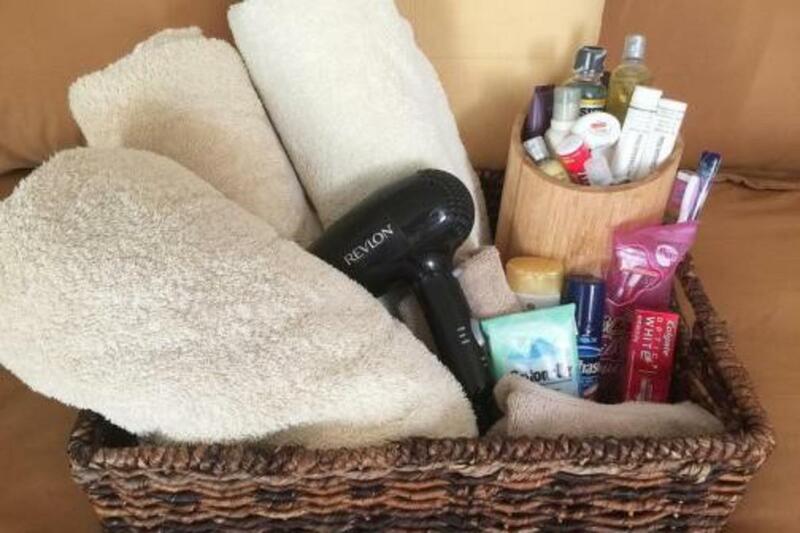 Put your stockpile of samples and hotel toiletries to good use. Tiny shampoos and lotions arranged in a basket or vintage apothecary jar are as welcoming as they are practical. Guests will be relieved if they forgot their own, but even if they didn’t, they’ll love the luxury of washing their hair on the house. When you miss a dust bunny at home, you may not think too much about it- but to guests, it’s disgusting at best and insulting at worst. So clean it all. Airbnb even tells hosts to scrub the entire bathroom, not once but twice, including the toilet, sink, bath, and floors after every guest. Family and friends come to town and choose to spend the night at your house rather than sterile hotel rooms because, in part, they want an authentic, personal experience. So give it to them! Scatter pictures and family treasures throughout your space. Frame a couple of your childhood photos and hang them up alongside some mementos from your own travels. Your guests may like to sing along in the shower, but the real reason for putting some tunes in the bath is to provide them with plenty of, well, privacy. Add an essential oil diffuser — or poo-pourri drops — and you’re in business. If your guests are early birds — or will just want some occasional alone time — put a coffeemaker in their room along with a well-stocked basket of coffee and tea. Maybe even blow their minds with a mini fridge full of snacks. To pull this off right, ask how they take their coffee in advance, and stock up appropriately. If your guest room closet could be featured on Storage Wars, it’s time to rethink your stuff strategy. Maybe donate your to-be-regifted pile and sell those designer jeans you've been holding onto since....highschool — to make room in the closet and dresser for guest to have plenty of space (and the key word is plenty). Label a few guest drawers and crack the closet so they can see there’s space to hang their clothes. Give guests a local’s-eye view by filling a basket with menus from nearby restaurants, brochures from local businesses that cater to tourists, and a current issue of your community newspaper. It’s a great way for guests to feel like a local and customize their time in your town. Help your guests feel right at home by hanging a couple of cozy (and freshly laundered), one-size-fits-all robes in the guest-room closet. Not only can they wear their pajamas to breakfast without feeling self-conscious, but they’re also super-comfy and great to wrap up in after a shower. Being the perfect host is perfectly achievable. With a little forethought, you’ll start racking up your own stellar reviews from your friends and family. Get ready to be the house everyone vies to visit.